This Saturday (November 9th, 2013) one of my latest art pieces “Sad Lady” will be a part of an art auction called VineArt. A friend and very talented artist Gloria Kagawa invited me to participate. 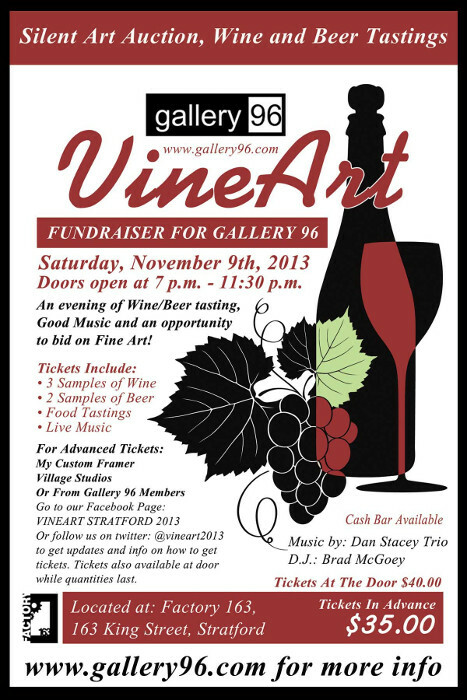 VineArt is held every year at gallery 96 in Stratford, Ontario. I’m excited to have the opportunity to be a contributing artist alongside other talented artists from the Kitchener-Waterloo area of Ontario. If you happen to be in the area please check it out! It is a fun evening of wonderful art, wine tasting, good music and lots of yummy food. Doesn’t get much better than that! If you’re interested in any of my art you see at the show or here on the website, or have any questions or comments, I would love to hear from you! Please email me at info@sandyrichter.ca. Previous Previous post: Why is the Lady so sad?